Have you noticed how many recipes call for coconut flour, coconut milk, or other coconut products these days? The health-affirming benefits of the coconut have become widely known over the past 10 years, and the spread of coconut-inspired health foods looks set to continue. As well as being a great addition to almost any diet, the coconut is also renowned for its versatility and the many different foods that can be created from it. In this guide to coconut products, I’m going to cover the major foods that are derived from the coconut fruit. As I’ve explained below, some of them will not be suitable for a low-sugar diet like the Candida diet, but I have tried to make this guide as comprehensive as possible. Most of these items should be available in your local supermarket or health food store, and you can certainly find them online too. Coconut oil is an edible oil which is made from the meat or kernel of mature coconuts. There are two main processes for extraction of the oil: dry and wet. The dry method is the classic technique, which involves using fire or sunlight to dry coconut meat extracted from the shell, resulting in what is known as copra. This copra can then be pressed in order to squeeze out the oil, or dissolved with solvents. Either way, the result is coconut oil plus a mash rich in fiber and protein. Although simple and straightforward, the dry process does lose oil along the way. The wet process uses the raw coconut instead of the dried copra, but it has to deal with the problem of separating the oil and the water inside the coconut, which are mixed together through emulsion. Original wet process techniques involved boiling the coconuts, but this resulted in a lot of wasted materials and discolored oil. Modern methods rely on centrifuges in order to separate the two substances, along with pre-treatments that use acids, salts, or heat. Despite their relative versatility and sophistication, wet processes are still not as efficient as dry ones due to a lower yield and the higher amounts of energy and time involved. Coconut oil has several different applications, although its primary use is for cooking. It is often touted as being a “miracle oil” compared to some of its other cooking alternatives. This is because, despite the fact that it contains 90% saturated fat and only around 9% monounsaturated and polyunsaturated fats, coconut oil is mostly made from medium chain fatty acids, making it a healthier choice. At the same time, the high saturated fat content ensures that the oil lasts for a long time and is also very heat-stable. This means that it is unlikely to degrade into trans fats when you cook with it. 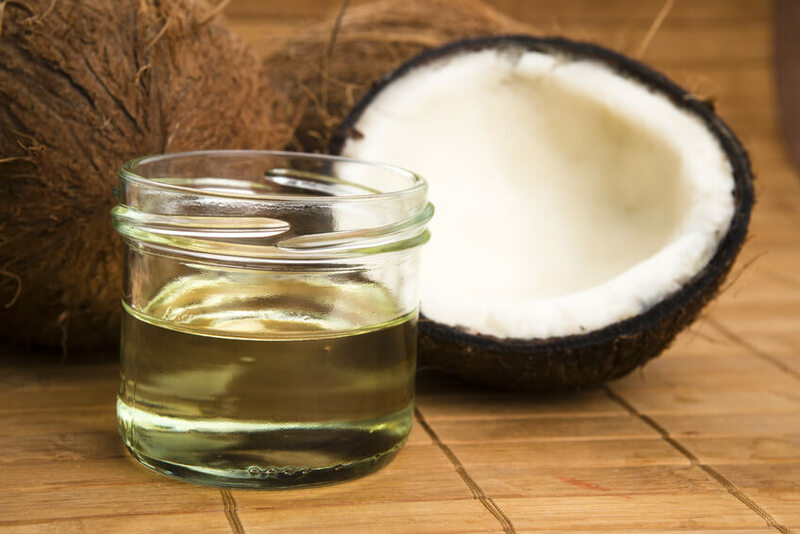 One of the benefits of adding this oil to your diet is that coconut oil has antifungal properties, which makes it a great choice for Candida dieters. Of course, coconut oil has many other applications, primarily in the beauty industry. It is used variously as a moisturizer, soap, toothpaste, deodorant, massage oil, sunburn lotion, antibacterial and antifungal skin cream, skin exfoliator, baby lotion, aftershave lotion and nail treatment. Other unrelated uses for coconut oil include head lice removal, disinfectant, antifungal, and homemade vapor rub. Coconut oil is available in a number of different varieties. If a coconut oil is described as ‘virgin’, this means that it has been processed without the use of chemicals or solvents. Rather than using complicated chemical processes, the oil is extracted through the use of pressure. This is a more gentle method that is far less likely to damage the oil. Note that, unlike olive oil, there is no internationally accepted definition of ‘extra virgin’ for coconut oil. This means that ‘virgin’ and ‘extra virgin’ coconut oil are usually just the same thing. There is another important distinction that you should know about – the difference between cold-pressed and expeller-pressed coconut oil. If your coconut oil is advertised as cold-pressed, that means that no heat has been used during the production process. This is likely to give you a sweeter, more aromatic oil. On the other hand, expeller-pressed coconut oil is subject to significant amounts of heat during production, and does not typically have the same coconut aroma or taste that cold-pressed oil does. In summary, always go for an organic coconut oil that is labeled ‘virgin’ or extra virgin’. If you like your coconut oil to have an aroma and taste, go for cold-pressed. If you prefer it to be flavorless, choose expeller-pressed. These various kinds of coconut oil can be found at most supermarkets. When it is taken home, it can last for up to two years as long as it is kept out of direct sunlight. It is a popular choice for cooking due to its versatility and stability, and can be used for frying, baking, even sauces and mayonnaise. If the oil is refrigerated or stored at cool temperatures, it goes solid and can be used as a substitute for butter or margarine. Coconut butter makes use of the meat of the coconut in order to achieve a thick, solid paste that has a similar texture to other traditional butters and is frequently used in cooking. There are several straightforward ways to make coconut butter, all using shredded and dried coconut, but the easiest one is simply to blend it. This can be done with a high-powered blender or a food processor. If the end result does not have the consistency of butter, some coconut oil can be added to the mixture (see the recipe below). Coconut butter is used almost exclusively in cooking. It is often be used as a substitute in recipes that call for coconut oil, but can also be added to curries, mashed vegetables, smoothies, and more. Many recipes that call for coconut butter are dessert recipes, although there are plenty of other dishes that can benefit from its flavor. It is full of healthy fats and vital nutrients such as magnesium and calcium so many people will even eat it on its own. Coconut butter is readily available at many stores and supermarkets, although it is also extremely easy to make at home for most people. Both store-bought and homemade butters can be kept for several months as long as they are stored in a pantry away from direct sunlight in a sealed jar or container. They are generally OK to be used on a Candida diet. Add 4-5 cups of dried coconut to your food processor. It can be either shredded or flaked, but it must be unsweetened. Run the food processor for at least 15 minutes. You will notice the texture of the coconut butter changing during this process, as it gradually turns into a thick, viscous liquid. You will need to periodically scrape pieces of coconut down from the sides of the food processor. If you are not getting right consistency, add a little coconut oil. Note that it should remain slightly runny while it is in the food processor. Pour out the butter our into a glass jar, cover, and store at room temperature. You will notice that it begins to solidify and harden. Coconut water is the liquid found inside coconuts and, although high in natural sugars, is highly regarded for its rich nutritional value. This natural juice is packed with minerals such as iron, calcium and magnesium, multiple B-complex vitamins, bioactive enzymes, electrolytes, and cytokinins. Coconut water works very well in treating dehydration, and particularly the fluid loss resulting from gastrointestinal issues such as diarrhea. Because of its special composition, it is regarded as being more effective than any kind of soft drink for this purpose. Although all coconuts contain this liquid, it is typically only the slightly immature ones (between 5 and 7 months of age) that are harvested for this purpose. Younger coconuts have water which is bitter and not yet rich in nutrients, while older coconuts do not have as much water as immature ones. If harvested at the most opportune time, a coconut can have as much as one liter of water inside it. In tropical countries, fresh coconuts are available throughout the entire year. In other regions they need to be imported, although they can be found in some larger supermarkets. Coconut water can also be found separately either bottled or packaged, although it is not generally as nutritious since it includes additives that prolong its shelf life. Once opened, the water in coconuts should be consumed immediately otherwise it starts to turn sour. It can last for a few days if it is stored in the fridge. Coconut water is not only tasty, but it is perfectly safe for all people including infants and pregnant women. Having said that, the large amount of natural sugars generally make it unsuitable for a Candida treatment plan. The biggest problem people encounter with coconuts is opening them safely! The coconut water is found inside the coconut and is protected by a hard outer layer. Some care and experience is required in order to open a coconut without issues or injuries. Typically, the most common method is to use a sharp tool such as a sickle in order to chisel out the shell at one end of the coconut and then cut into the hard layer. 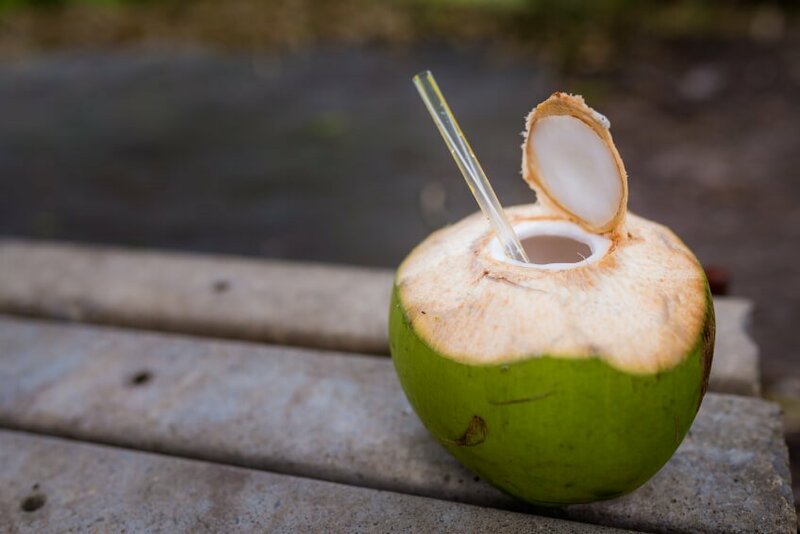 The coconut water can be sipped directly from the coconut with a straw, although some people prefer to add other ingredients such as mint leaves or lemon slices. There’s no need to fully open up the coconut to extract the coconut water. Here are three simple steps to get the water out quickly and easily. Find the ‘eyes’ of the coconut. Most coconuts have three eyes at the top, although some types only have two or even one. They are small, indented markings and should be easy to find. Using a screwdriver or skewer, poke a hole through one of the eyes. Usually, one of the three eyes will be much softer than the others. If you can’t do this, using a hammer and nail is a good alternative! Turn the coconut upside down and rest it on a bowl to collect the water. The larger you make the hole, the faster the water will drain out of the coconut. Coconut milk should not be confused with coconut water, as they are two completely different things. For starters, coconut water is clear and coconut milk is white. They are also obtained in different ways. Don’t confuse real coconut milk, which is usually found in a can, with the coconut-based milk substitutes found next to soy milk in your supermarket. These milk substitutes usually contain carrageenan and a variety of unhelpful additives and preservatives. When I talk about coconut milk on this website, I mean the coconut milk that comes in a can. 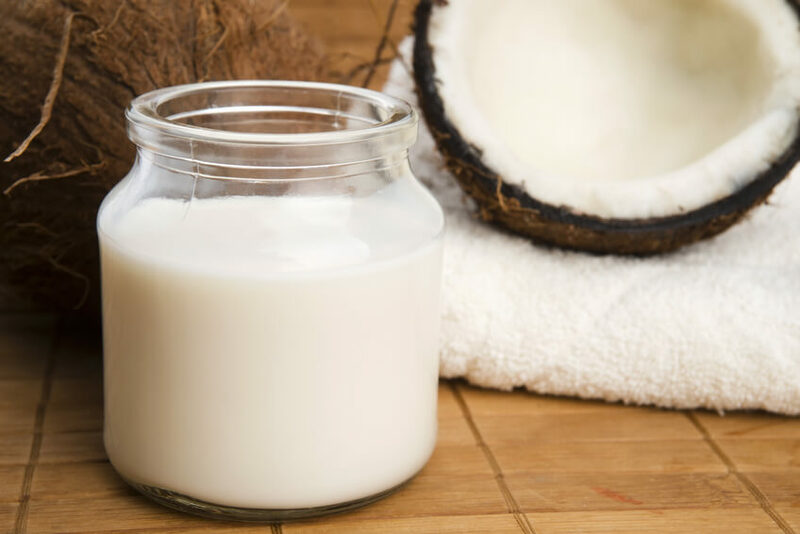 Various preparation methods allow for coconut milk of varying fat percentages, ranging anywhere from 22% to 5% fat. High-fat coconut milk is traditionally obtained by grating coconut meat and squeezing it through cheesecloth. In order to decrease the fat percentage, the coconut meat is left to soak in warm water and then the process is repeated two or three times. It is also possible to make your own coconut milk at home. Coconut milk is used primarily in cooking and is an excellent addition to a Candida diet. It is an important ingredient in many different cuisines, particularly Asian (see this grilled chicken with bok choy recipe). The thinner milk is typically used in most dishes, while the thicker, fattier coconut milk is normally reserved for sauces and desserts (try this Candida-safe coconut ice cream). Occasionally, coconut milk is also used as a drink (see this coconut smoothie). On its own, it tastes somewhat similar to cow’s milk and it is often served diluted with water. More commonly, though, coconut milk is mixed with other ingredients in order to obtain various popular drinks such as Pina Colada. However, coconut milk also contains plenty of oil which has its own particular uses. Consequently, it is very rich in fat so it is not recommended that people consume excessive amounts of it on a regular basis. One unusual use for coconut milk is in horticulture! It was discovered that the milk can promote plant growth due to its content of cytokinins. Although it does not work for all types of plants, some grains such as wheat have yielded significant improvements by adding 10% coconut milk to its substrate. Which coconut milk should you buy? There are a couple of factors to consider when buying coconut milk. Firstly, I would recommend always buying an organic brand. These are very easy to find, relatively inexpensive, and should be available in your local supermarket. Coconut milk is usually stored in tin cans, which often use a toxic chemical named BPA in their linings (the same BPA that you find in some water bottles). BPA is a known toxin that has been shown to emulate the hormone estrogen. Consider finding a coconut milk brand that uses BPA-free cans. At the time of writing, Native Forest Organic Coconut Milk is a good option, and that’s what we have listed in the recommended foods section. Coconut milk is readily available in supermarkets all over the country, although there are also various methods to make it at home. One easy technique involves simply combining water with shredded or flaked coconut, also available at stores. In a blender, mix together two parts boiling water one part shredded or flaked coconuts. When the mixture is as smooth as possible, strain out the solids. The remaining liquid is your coconut milk. The milk can be stored in a glass jar and kept in the fridge for up to around 2 weeks. Coconut flour is made from the solid remnants left over after making coconut milk. It is another great addition to a Candida diet, and is perfect for baking foods like coconut bread and coconut flour crackers. Many people prefer it because it does not contain any gluten or grains, making it an ideal for those with digestive problems, gluten intolerance, or leaky gut. It is also rich in fiber and protein. Lastly, coconut flour is typically sweeter than other types of flour, so baked goods that use it require less sweetening. When coconut milk is made, some solid pieces are left over after the final straining process. After a while, these solids turn to flakes and, if they are baked and then blended, the result is a white, powdery substance that is used as flour. Coconut flour is often used for cooking and represents an excellent alternative for people who do not want to consume grains or who are allergic to gluten. Others simply prefer the taste of food prepared using this flour. The sensation of eating a cake or bread prepared with coconut flour is quite different from other flours due to its very high fiber content. Baked goods are typically heavier, denser and much more satiating. Although it can be found already processed and packaged in many stores around the country, it is also possible to make coconut flour at home. Once you have made coconut milk, you already have the ingredients necessary since the flour is a by-product of the coconut milk process. The pulp left over after making coconut milk should be spread out over a baking sheet and placed in the oven at 200 degrees Fahrenheit until it is completely dried. Afterwards it should be processed in a blender or food processor until it turns into a fine powder and is ready to be used as coconut flour. The flour can be stored in a dry area for several months. There is very little difference between flaked, shredded and desiccated coconut, so many people use them interchangeably. They are all made from the meat of the coconut, which is ground or put through a grater. The biggest difference between the three of them is the shape. 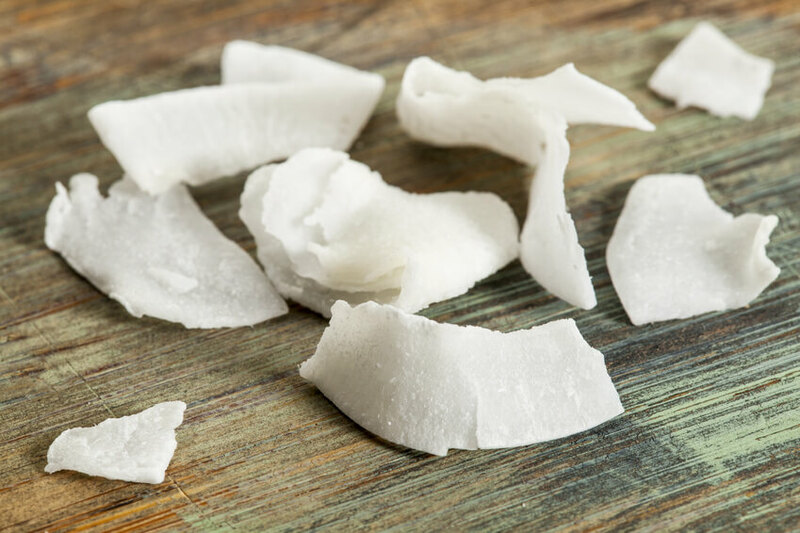 Shredded coconut comes in long, thin strips; flaked coconut comes in smaller, flatter pieces; and desiccated coconut is even finer and obtained through grinding. As its name suggests, desiccated coconut has most of its moisture removed from it while shredded and flaked varieties still contain some moisture, although they are both also dry. All three varieties are used in cooking, primarily for desserts. Although they are sometimes included in the recipe itself, most of the times the coconut is used as a topping sprinkled over the dish. Shredded coconut can also be used to make your own coconut milk. Desiccated, shredded, and flaked coconut are all OK on a Candida diet as long as they don’t have any sugar added. These different types of coconut can be found at many supermarkets and groceries, particularly ethnic ones. However, it is also possible to make them at home from regular coconuts. The meat of the coconut needs to be dried beforehand. Then it is simply a matter of grating or grinding the coconut until you achieve the proper consistency. The end product can be stored in a dry place and kept there for up to six months, as long as it is packaged carefully. Coconut sugar is a type of sugar that is obtained from the coconut palm tree, differentiating itself from most other coconut products that are made using the fruit itself. That is why in certain areas it is referred to as coconut palm sugar in order to avoid confusion. It is a natural sweetener that has become more and more popular in recent years. It is used in cooking or in any other areas where people would prefer an alternative to refined sugars. Research is still ongoing regarding the merits of coconut sugar, but it appears to have more nutrients and a lower glycemic index than refined sugar so it is considered to be a superior sweetener. However, it is not generally suitable for diabetics or those on a low sugar eating plan like the Candida diet. Coconut sugar is obtained by collecting liquid sap from the coconut palm tree, then leaving the sap to dry in the heat. After most of the water has evaporated, the resulting product can be ground and used as sugar. As the popularity of coconut sugar has increased it has become more readily available. Many natural food markets stock it and it can also be found online. Although the process of making it is simple, it does require access to palm tree sap, which is not easy to come by. Like coconut sugar, coconut nectar is another natural sweetener provided by this plant, except that this one is in liquid form and it is made from the sap of coconut blossoms. It is rich in minerals and vitamins and also has a lower glycemic index than most sweeteners. Coconut nectar is often used in cooking as an alternative to agave nectar. It has around 10% fructose, which is far lower than the 50% to 90% which is commonly found in agave nectar. It is made through a simple and natural process that involves collecting sap from coconut blossoms and boiling it. Initially, the sap is dry and thick, but it reaches a far more liquid state at the end of the process. Coconut nectar is not a very common coconut product. It is not available in all supermarkets or groceries, but it can be found online and in many natural food markets. Coconut aminos is an amino acid liquid that is often used as a substitute for soy sauce, even though it does not contain any soy. This remarkable liquid is actually made from the sap of the coconut palm tree. In order to make the coconut aminos, the sap is mixed with a sea salt rich in minerals. This creates a product that is close in texture and taste to soy sauce. Coconut aminos has a lot of applications in cooking, basically in any recipe where you might use soy sauce. It can therefore be used in many Chinese and vegan recipes, but it is also employed for sauces and for salad dressings. From a nutritional standpoint, coconut aminos is far more potent than traditional soy sauce due to the significantly increased quantities of amino acids. If you are concerned about the use of GMO soy in your soy sauce, coconut aminos is an excellent alternative, and is suitable for a Candida diet. Coconut aminos is found in many natural food markets and is also available online. However, the flavor of the product can vary significantly from one brand to another based on the type of salt that they use. Coconut vinegar is a condiment that is similar to other types of vinegars obtained through fermentation. It has a white color and a very pungent and acidic taste, and it is the preferred type of vinegar used in several Asian cuisines. It is a better choice than regular white vinegar if you’re on a Candida diet, but not as suitable as apple cider vinegar. Coconut vinegar is made either from coconut water or from the sap of the coconut palm tree. This is boiled in water and yeast is added, giving it a distinct taste compared to other vinegars. It is then set aside for various lengths of time depending on the desired acidity level. Coconut vinegar is used in cooking and it is a preferred condiment in many cuisines. It also contains plenty of minerals and amino acids. For people looking to use it in their recipes, it can be used as a substitute in most recipes that normally call for vinegar. That’s a pretty long list of coconut products, and I hope you find it useful in designing your diet and picking healthy choices. Most of these coconut products are suitable for a Candida treatment plan, with the exception of the coconut sugar and coconut nectar. With the other products, just make sure that you are buying good quality brands (organic where possible) and eat a reasonably balanced diet. For more information on designing a Candida diet that works for you, check out the treatment program that I created with Dr. Eric Wood. I have Candida and am on a Candida diet. 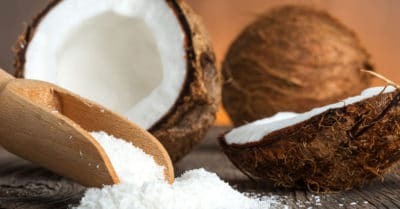 Which of these coconut products should I avoid? Yes, definitely. First hand experience, before I knew I had candida overgrowth. I would drink fresh coconut water for electrolytes and hydration after exercising… only to feel HORRIBLE afterwards. Stay away from all forms of sugar! Hi Chelsey. Sorry – coconut sugar will spike your blood glucose just like regular sugar, although it is nutritionally better in other ways. Best to avoid it for now. Thank you for your encouraging words! I’m just starting my candida journey. Hi, I can not find any info on HCP70 is it discontinued? The Progressive website won’t opne the link for the product!! This is a very good article. I haven’t got the time to go through all of it, but I’ve saved it on local. I love coconut, they are really tasty, not to mention cheap. And good for our health. You’re doing a great job here! Can you eat coconut flesh instead of the oil? Lisa, you might have saved my wife’s and my lives. The fungal overgrowth has greatly diminished our health both physically and mentally. We are both obese, lifeless, energy deficient and both suffer from phantom pain through our our bodies. Pre-diabetic neuralgia interrupts our sleep, further disrupting healing. Unable to lose weight regardless of what we try results in furthering this downward spiral. I often walk with a cane & suffer from depression. We worked all of our lives but just cannot enjoy retirement. I hope we can turn some this around in order to salvage what time we have left together. I am extremely grateful for your knowledge and ability to share same. We are on a fixed income and hope and pray this will help us both. We shall keep you posted. Google CCWS treatment. It will save your life. I saw that if on a Candida diet, we should avoid the water, sugar, and nectar, but what about the vinegar? It says that yeast is added, so I assume that’s also off limits? Thanks for the great info! Hi Bianca! The coconut vinegar from Coconut Secret is fermented naturally over 8-12 months. They don’t add any yeast to the product at all. However, similarly to naturally fermented drinks like kombucha, the fermentation process means that it will certainly contain some varieties of wild yeast. These yeasts are often beneficial, and don’t usually include Candida Albicans. However, if you have a yeast sensitivity then you might want to avoid it. I’m sorry for the inconclusive answer, but it really depends person by person. I hope that helps a little! Hello, how about coconut water kefir? Added kefir cultures to coconut water and fermented for 48 hours. Would that be ok while on candida diet? I was wondering about the solid vs. liquid oils for oil pulling. I bought solid, virgin, organic coconut oil. Can I heat this or do I need it in liquid form? Hi Stacy, coconut oil is actually liquid at slightly higher temperatures. As soon as you put it in your mouth it will turn liquid. Hi, I too have been diagnosed with a yeast overgrowth. This website is a wealth of information! I have just tried drinking 2 teaspoons of coconut oil and almost gagged! You’re saying I could eat coconut meat instead? How much meat would I need to eat to equal 2 tbs of oil? Yes make cubes of coconut butter, keep them in fridge, and pop one in your mouth a few times a day…yummy! If you are toxic (with candida, metals, molds, etc) coconut oil is horrible to try to swallow straight–it literally burns. I love this idea! Fridge of freezer? And do you add anything else to it? Does it only burn if one is toxic? Why would it burn?….. I love it so much I can eat it from the jar. But refrigerated cubes sounds way better!…. This could be a good pre-work out snack? Maybe mixed with MTC oil?… Love the idea! is it good for candida killing? Does coconut cream mix well with water? I would want to just drink it straight. Can you provide a simple recipe to make coconut water? It’s ridiculously expensive in stores. Thank you. would the coconut flour be a good replacement for someone on a grain free diet if they have problems with yeast? Yes! I started using it. I made pancakes and a normal batch too 1/2 C of coconut flour. The only difference, to me, was that the texture was a bit gritty and hard to eat the first time. But like any other change, you just have to get used to it. I quit using sugar for my coffee and, replaced it with Stevia. At first, it was hard because I loved my sugary coffee. But after a month I put sugar back in it and it was too sweet! I only added a tsp. Anyway, if you can overcome the texture change, it’s smooth sailing. I have a few questions about picking the right coconut milk. First, is coconut milk the best alternative milk on the Candida diet? If so, is the best choice still the native forest organic coconut milk? Is canned better than the milks in the cartons? It needs to be sugar free, right? Also, are there other added ingredients we should stay away from, like guar gum, xanthum gum, etc.? Thank you in advance for your help! I’m new to the diet and it’s a bit overwhelming to look through all the information sometimes. Thanks again! Yes the Native Forest is a great option for coconut milk! Generally speaking, the coconut milks that you find in cartons (in the milk section) contain ingredients like carrageenan that can cause digestive problems. I hope that helps! The fewer ingredients, the safer it is. Coconut whatever should be the first or second ingredients. Download the smart phone app for additives and preservatives. You’ll learn very quickly what ingredients are cancerous or cause problems. hello! i bought artisana brand raw coconut butter for a recipe, it seems SO sweet after only having stevia for 30+ days into this diet, it’s worrying me ha! it says 2 grams sugar (no added sugar though) per 2 tbsp serving- so 24 grams of sugar in the whole jar, that’s like a soda isn’t it? it seems too good to be true. just curious your thoughts, don’t want to sabotage my progress in anyway! also curious- my coconut aminos i’ve been using also seems so sweet! just has coconut sap and sea salt-so coconut sap isnt the same as coconut nectar? promise? haha thank you, i appreciate any feedback!! That does seem like a lot of natural sugars in the coconut butter. Maybe use it in small amounts only! Hi Lisa, my daughter have yeast more than the good bacteria, so she’s on SCD diet with a Dr plan to clean the yeast with different supplements. My question if I make her Coconut milk home made, with that be okay? does that feed the yeast just because coconut has some sugar and carbs? Thanks for your help..
Coconut milk (the canned, unsweetened one) is actually pretty low in carbs already. There’s no need to make your own unless you really want to! Hi Lisa and all other fellow citizens concerned with candida taking over their lives…. I am wondering about the use of nutritional flakes during the candida diet. I assume it is acceptable as it is not a living yeast, but I can’t really find any solid answers. Thanks to anyone who can confirm or deny its candida diet legality! I assume you mean nutritional yeast flakes? That really depends person-by-person. However, many Candida sufferers are particularly sensitive to yeast, whether dead or alive. So it may well cause an aggravation of symptoms if you are one of those individuals. Oh no! I am following the diet religiously and read so much about the benefits of coconuts that I only expected the sugar and syrup forms of it to be a no no. I have been drinking coconut water 🙁 well, better late than ever, thanks for the info! Can I eat a couple of handfuls of 100% organic, unsweetened coconut flakes for a snack? Just to clarify, i am on the anti candida diet but my case is not that severe, i am to avoid sugars though. However i have bought some unsweetened coconut milk with nothing in except that and rapeseed oil is this ok in small doses, as its naturally occurring coconut sugar? Can I eat coconut flour and coconut milk during a candida cleanse and after as well? I know that unrefined coconut oil should not be heated over 350 degrees, while refined can be heated up to around 425. What about coconut aminos? Can I use it in the broiler? Can I drink the water direct from a coconut while on the diet? Thank you for all the info, Q&A’s! For people with extreme candida overgrowth needing a strict diet to rid the body of candida… do you have a full list of do’s and don’t’s for diet? Is that info in your book, a diet for those with chronic candida and a plan to overcome that? What nuts, seeds, berries, fruits, citrus etc? What probiotic supplements, foods etc? What probiotics? From what I’ve read all fermented foods are out. All vinegars (coconut/ACV), all krauts, all yogurts including coconut yogurt. All sugars, including the coconut sugar and sap here and products containing coconut sap (aminos). Is this all correct? I read here coconut water, coconut sugar and coconut nectar are out but coconut milk, flour, flesh, butter, flakes, oil are all good for chronic candida. Correct? Thank you so much!!! Tapioca starch is also a NO NO people !! Thanks for taking time to post this online. Keep me updated with new coconut discoveries. I’ve been using the coconut aminos lately (soy sauce alternative) and have noticed that I get a few symptoms (some gas and breakouts). Do you think that this is from the natural sugar in the product which is feeding the yeast? Hi Nikko, it contains very little sugar so that’s unlikely (although possible). Are you sure it’s the aminos? If so, it might just be that they aren’t compatible with your body. Maybe try Braggs aminos instead! If you are sensitive to yeast products it could be a problem. I ate the aminos religiously until I realized that they are fermented. People with yeast sensitivity cannot tolerate fermented products. Lisa thank you so much for your details. I enjoyed this immensely and look forward to reading more from you. Candida is such a common problem these days. I will refer my clients, family and friends alike your way for more valuable imformation. This is exactly the post I was looking for! Thank you for breaking everything down so thoroughly. Quick question here: Can I purchase a sugar free coconut yoghurt and consume that as an alternative to the recipes you have that contain conventional yoghurt? My body is no longer tolerating any dairy with the exception of small amounts of ghee. I’m looking to get more creative with recipes as I’m on my healing journey from candida, and the addition of coconut yoghurt would be grand. I don’t see why not. As long as it doesn’t have a bunch of sugar substitutes that might cause other problems. Is guar gum safe for candida diet? Lol I’m confused! I read just a PART of this one online article and said it’s inflammatory And now I’m just reading articles titles and descriptions on google when I look up “guar gum SIBO” and some say it helps clears it. Lol someone know better than I?